What media sites are Pittsburghers really reading? What does it mean to be a successful online media company? Media site operators have more access to analytical data than ever before, but they rarely share that information beyond ad agencies and sponsors— and the public hardly ever sees these companies with granular detail. Clearly consumers have an appetite for content, though they may not always have any expectation of paying for it: the Pew Research Center’s recent report on local news suggests that Pittsburghers — like most Americans — rarely pay for news and they value daily updates on things like the weather, crime and traffic. So I asked several local media entrepreneurs and executives how they measure success. They said they look at web analytics, of course, but they also rely on metrics such as membership contributions, corporate sponsorships, foundation grants and more. The most obvious indicator remains the bottom line: Can they stay open to keep telling original stories? Alexa ranks PublicSource at 149,335 among U.S. websites, while SimilarWeb places it at 251,426. PublicSource started in 2011, and it became a stand-alone nonprofit in 2015. Much of its funding comes through foundation support, while its number of annual members has grown to 525 last year from 20 in 2016. (For the record, I served on PublicSource’s board until last year). 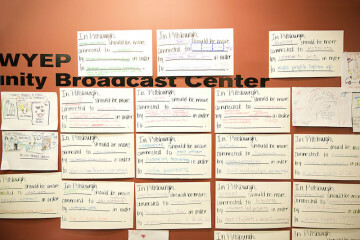 Pittsburgh Community Broadcasting Corporation, which includes WYEP and Pittsburgh’s NPR station, WESA, relies on a mix of foundation and government grants, and member support, CEO Terry O’Reilly said. WESA ranks 72,133 on Alexa and 78,506 on SimilarWeb. O’Reilly shared some of his metrics for the stations: Gross revenues this year are $7.3 million, or an increase of more than 33 percent since 2016. Membership is up 23 percent over that time, with more than half the members providing sustaining support through an automatic monthly donation. Membership makes up 44 percent of revenue this year, while government support has shrunk to 4.5 percent of the budget from 8.2 percent three years ago. Pittsburgh City Paper, which produces a free weekly newspaper, has started building up its web traffic by including more breaking and up-to-date daily information, editor-in-chief Lisa Cunningham said. The news outlet (current Alexa rank: 39,248 / SimilarWeb: 60,610) has also started a redesign of its website to show more stories in a user-friendly format, and to create a new events page with both editorial listings and sponsored posts by advertisers. NEXTpittsburgh, which publishes this column, seeks to balance building online traffic with producing stories that have impact even if they are not expected to generate a lot of clicks. The website (current Alexa rank: 23,155 / SimilarWeb: 72,823) gets some of its best traffic from development stories but also on issues that connect with readers: A feature on Lenore Blum talking about why she is leaving Carnegie Mellon University over sexism in the workplace drew more than 100,000 web hits. For WhereBy.Us, The Incline’s new owners, the challenge will be how to maintain and expand its relationship with Pittsburghers. The Incline’s current Alexa rank is 94,766 and SimilarWeb is 159,218. Sopher’s company operates other local sites in Miami, Seattle, Portland and Orlando, and it claims 75,000 email subscribers among them. Sopher declined to talk about The Incline’s revenues or how many subscribers and members it has. Instead, he said the real test will be whether The Incline can be an indispensable part of daily life for its followers. They say the best things in life are free. At a time when fewer people expect to pay for news, online media companies have to hope long-term relationships somehow also help them keep their doors open.